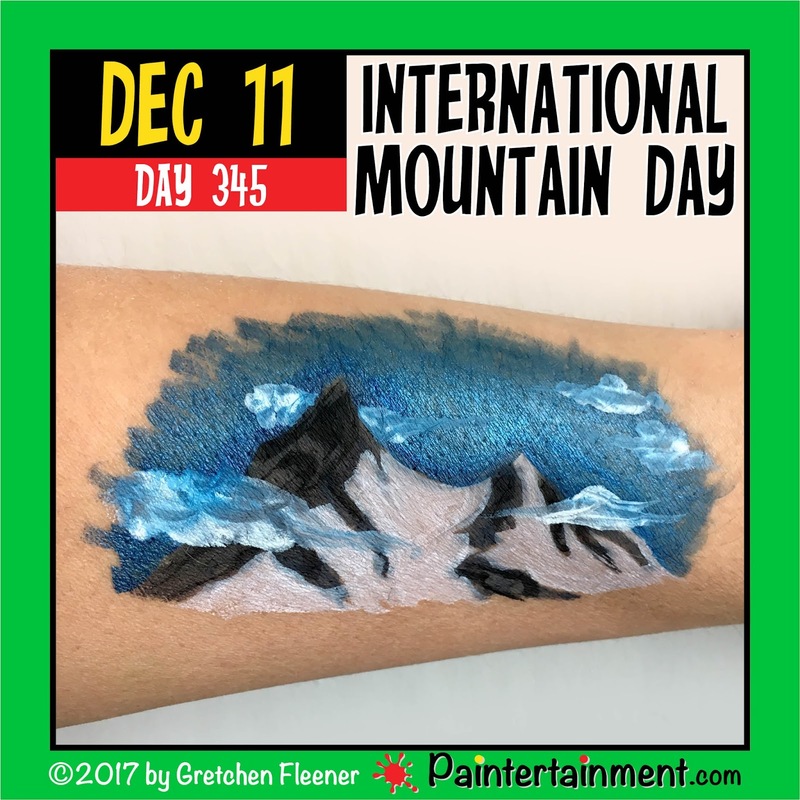 It's become a tradition now for me to look back on the year and record some of my milestones with my business...here's what happened with Paintertainment in 2017! Last January I decided to tackle some of the most mind-numbing frustrations of being a small business owner, and started taking a series of business finance courses online, as well as Quickbooks classes! Thank goodness for my phone which enabled me to watch courses while on the treadmill! 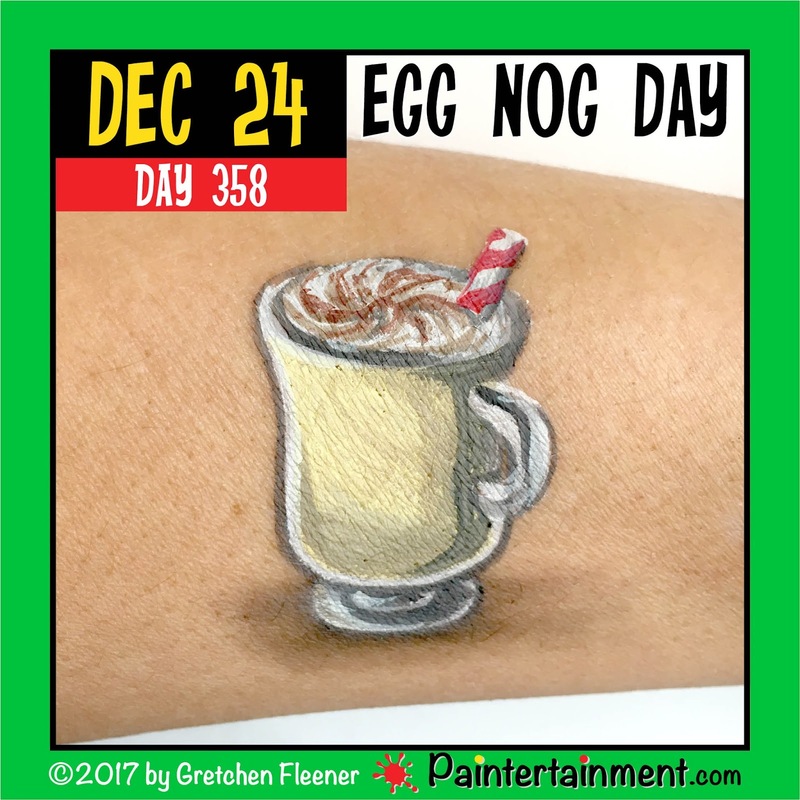 I also started up my 365 day personal painting challenge, where I vowed to post a painting on my blog every single day of the year that corresponds to whatever holiday was that day! I also began a major renovation of my store (located in my basement! 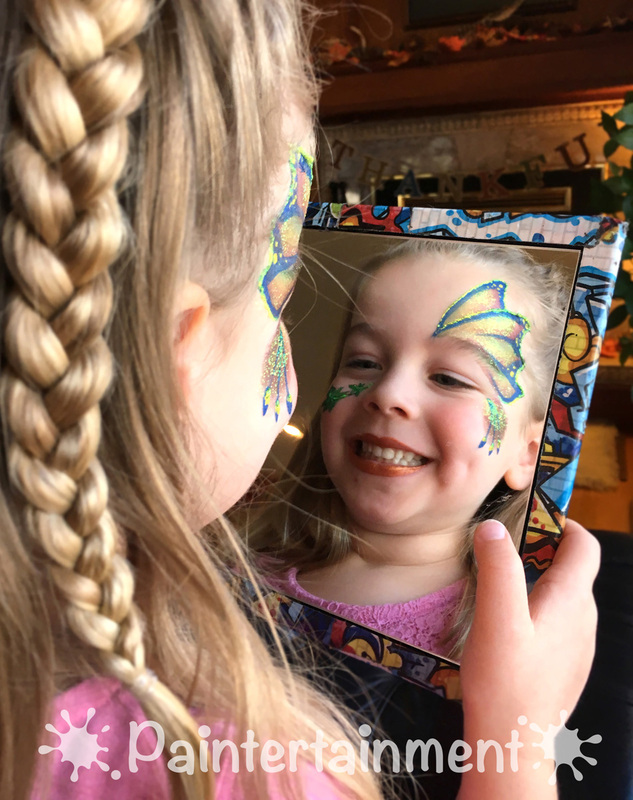 ), making it much more inviting and easy to shop for local artists who shop Paintertainment in person! In April I launched the first ever issue of Wet Paint Magazine! Creating a face and body art magazine is something I've been wanting to do for many years, and 2017 felt like the right time. In May I had my first chance to create balloon pillars! I made some giant robot pillars which was super fun! In August I enjoyed my 5th year at the Carver County Fair! I also released the fall issue of Wet Paint Magazine, the 2nd issue! In September we released a brand new set of Halloween themed photo prop boards! 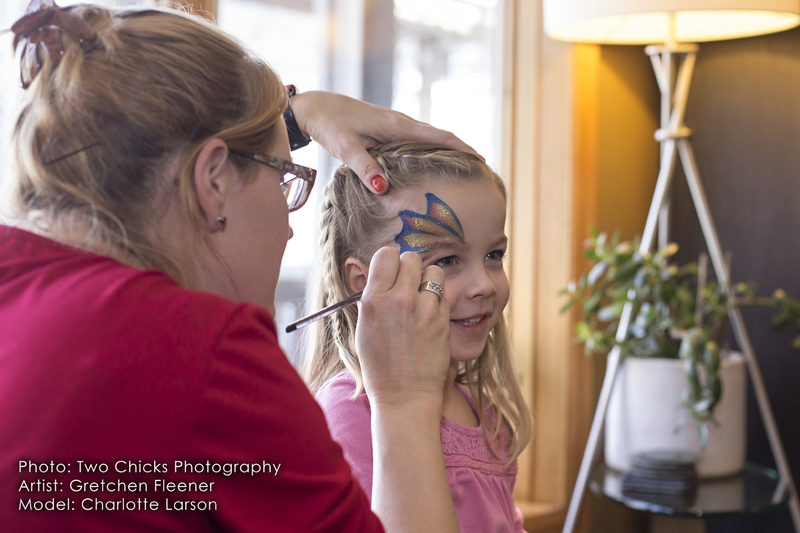 In October I had the pleasure of speaking at the MN Professional Family Entertainer & Artists' Business Conference! I also LOVED painting this fun Nightmare Before Christmas baby bump! 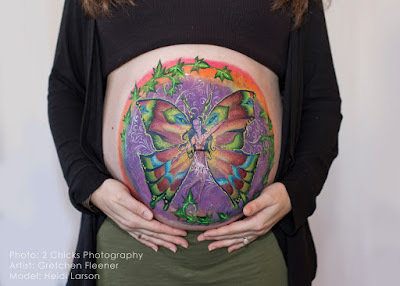 In November I had a wonderful time painting another beautiful baby bump with a butterfly princess design, and corresponding face painting. 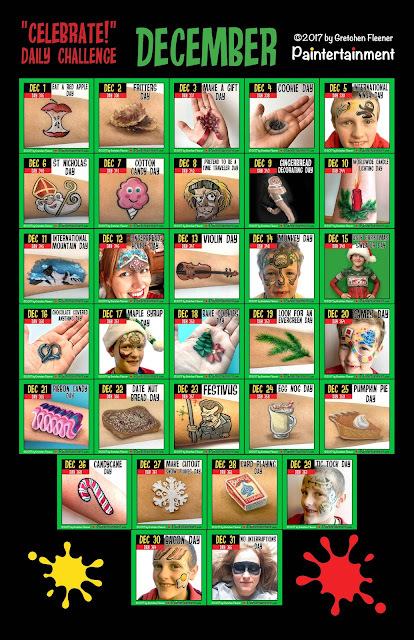 I also completed the first volume of Wet Paint Magazine with the release of our winter issue! In December I completed 365 days of posts for my personal challenge!! 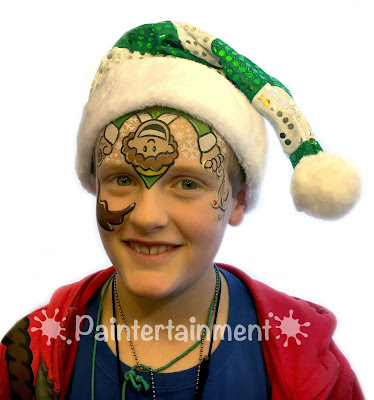 I also had fun painting a Christmas sweater on my son Sam, which I used on my Christmas cards and also entered in Paintopia's "Christmas Jumper" competition. Do you still LOVE your job? So What does 2018 hold? I don't really set any "official" goals because I'm constantly coming up with goals that I'm striving towards, but here are some of my ideas that I think will come to fruition in 2018. I gave it a good run, using Quickbooks for years, but even after all of this education I still despise it. So, this year I'm hoping to move on to new, better, more intuitive accounting software! Ugh, boring news, but an essential part of business ownership! While I've loved posting a painting every day in 2017, I did notice that it left me less time to work on other things like new YouTube tutorials, blog articles, and that new book I'm still trying to complete! So, I plan to work on more of those things in 2018! I'm also SUPER thrilled to be invited back to teach again at the Jamvention in Belgium!! They will be celebrating their 10th anniversary so it's gonna be BIG...I can't wait!! Stay tuned for more on what I'll be teaching as the Jamvention draws nearer! I have more adventures coming in 2018 that I'll unveil as the year unfolds! 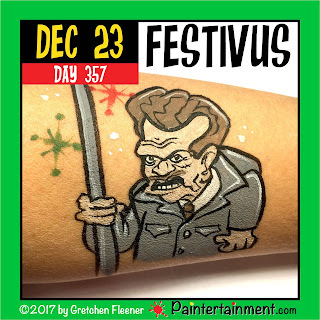 Thanks for following me this past year...I hope to bring you plenty of great new inspiration, education and anything else I can come up with in the new year!! Happy new year and happy painting! 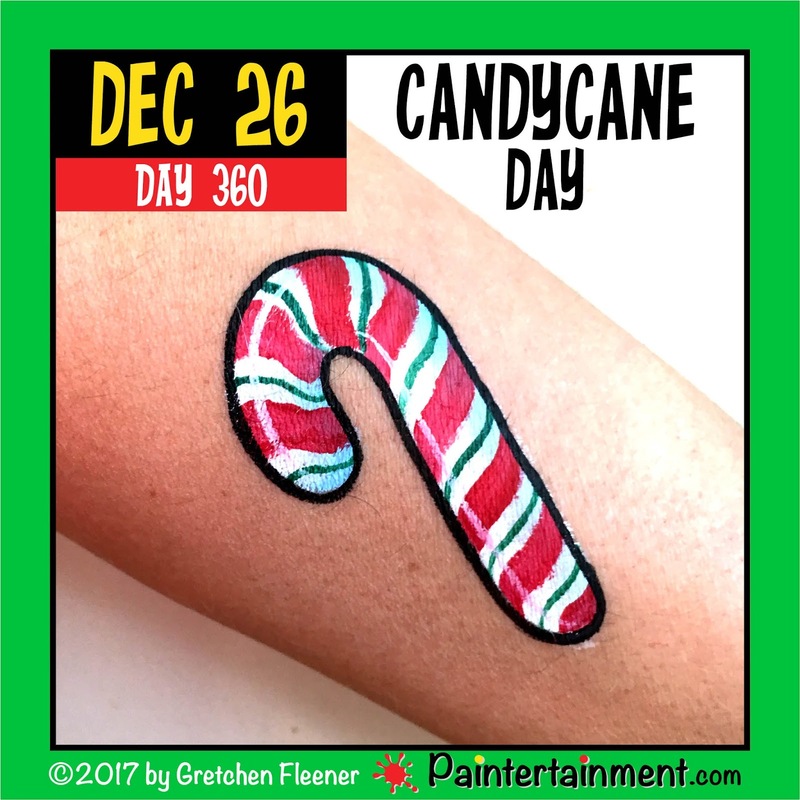 365 Day Celebrate Challenge: December Recap! Wow! 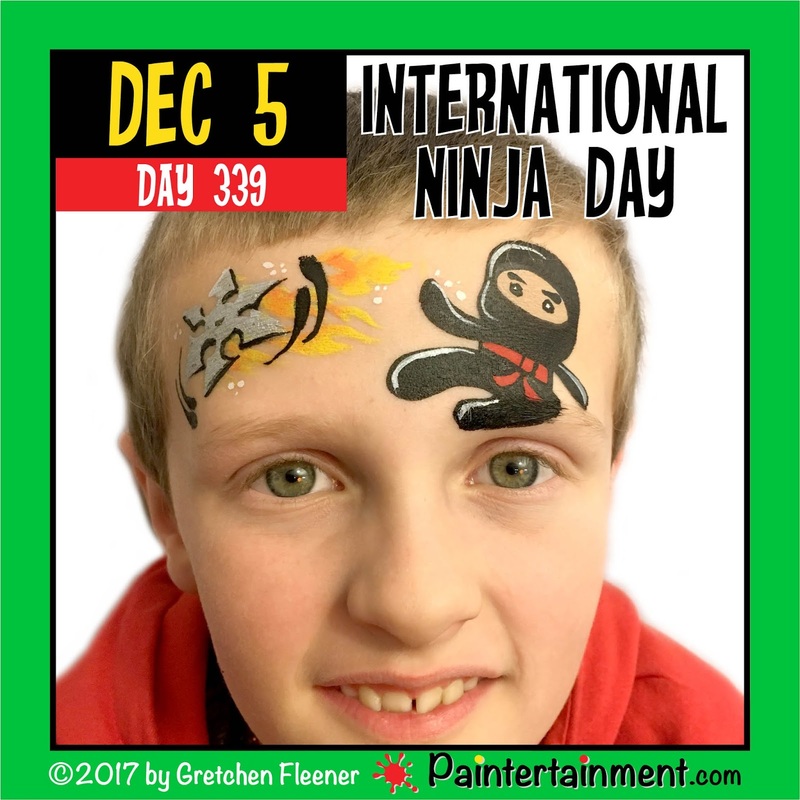 365 days of painting posts...it has been one incredible year!! Be sure to check out the upcoming issue of Wet Paint Magazine (spring 2018 due out early February) as I'll be publishing an article about my year long challenge, and also interviewing another balloon twister about her own personal challenge this past year! Celebrate Day 365: "No Interruptions Day!" 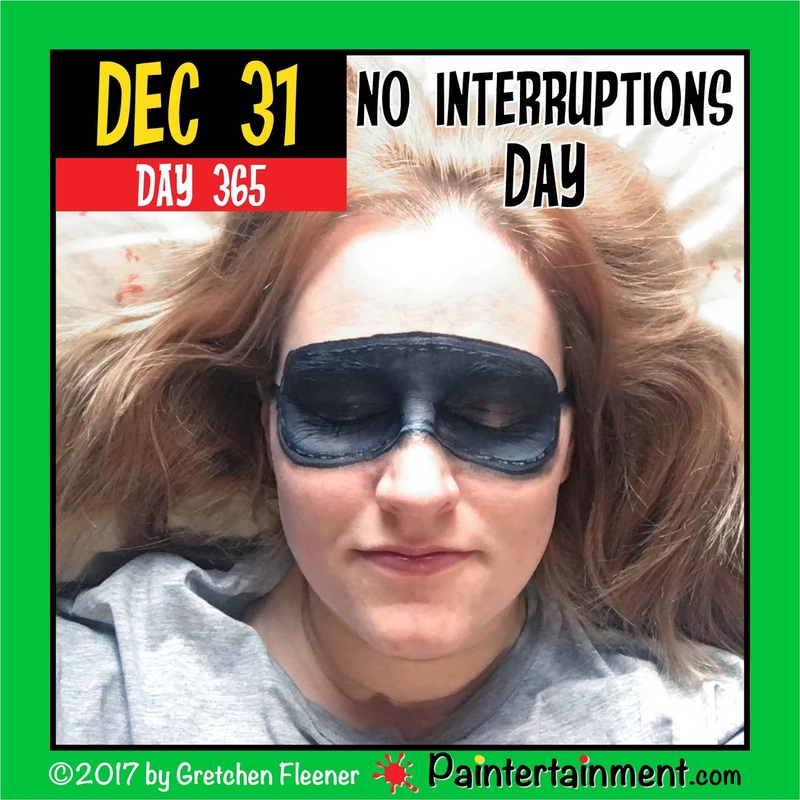 Happy "no interruptions day!" 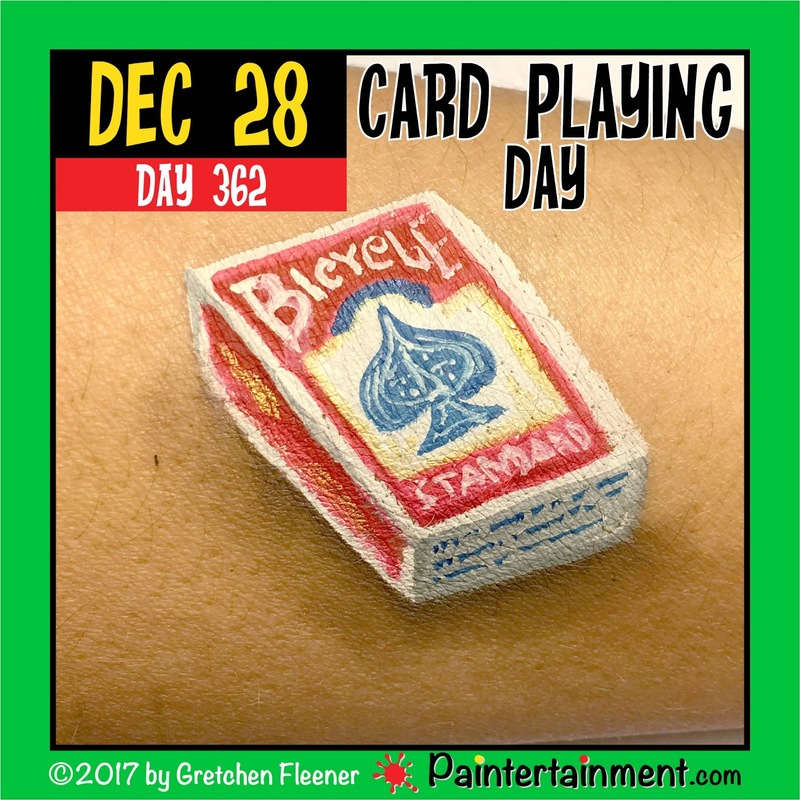 And wow...happy LAST day of my 365 day challenge! 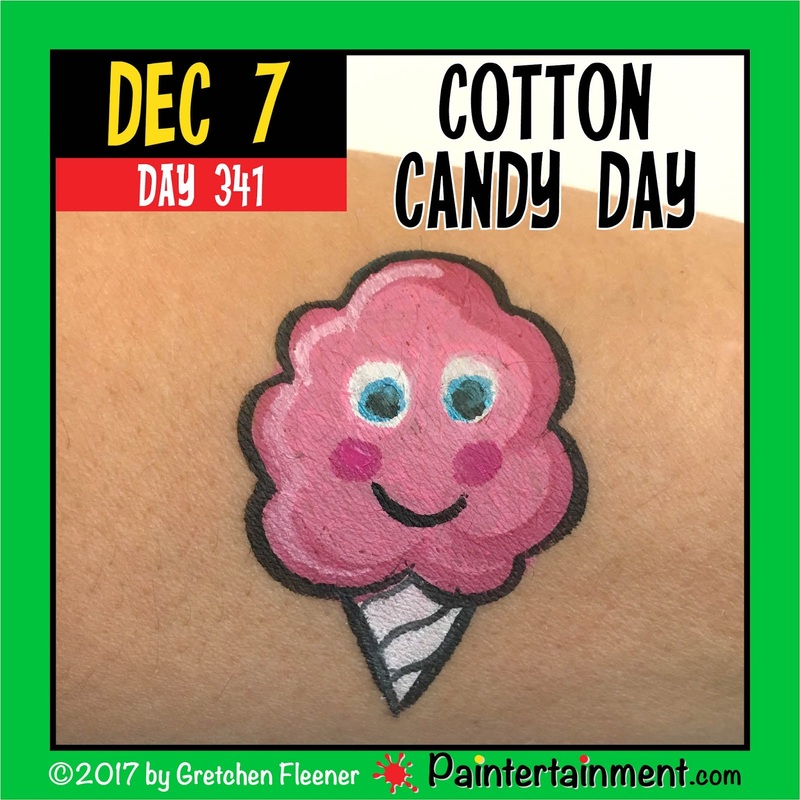 I can't believe I was really able to post a painting every single day!! 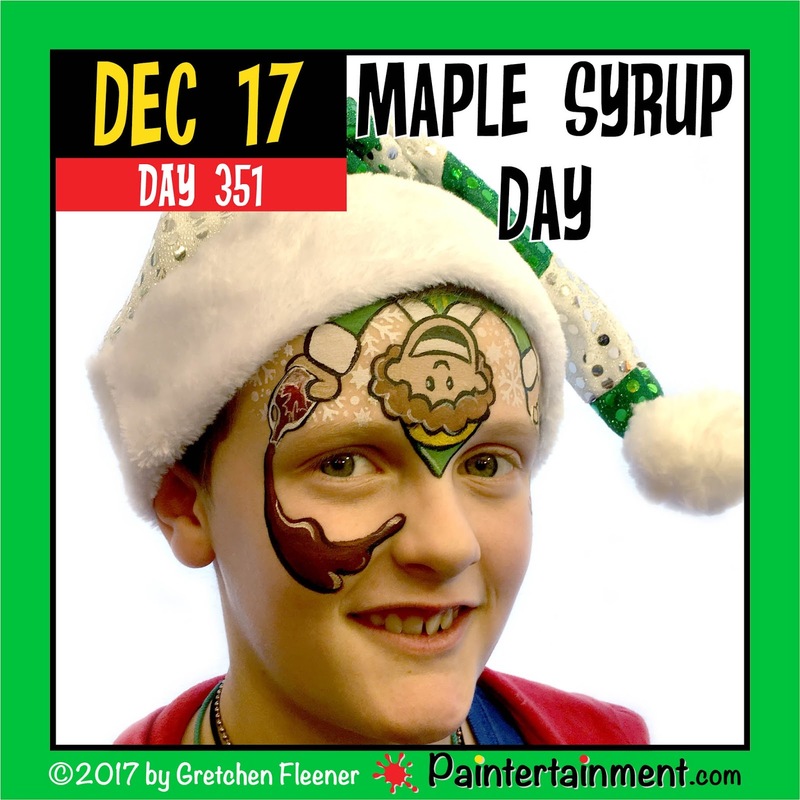 Stay tuned for a collage of December with some of my favorites, and be sure to get the spring issue of Wet Paint Magazine (due out in February), where I will be writing an article about my challenge as well as another balloon twister's personal challenge! 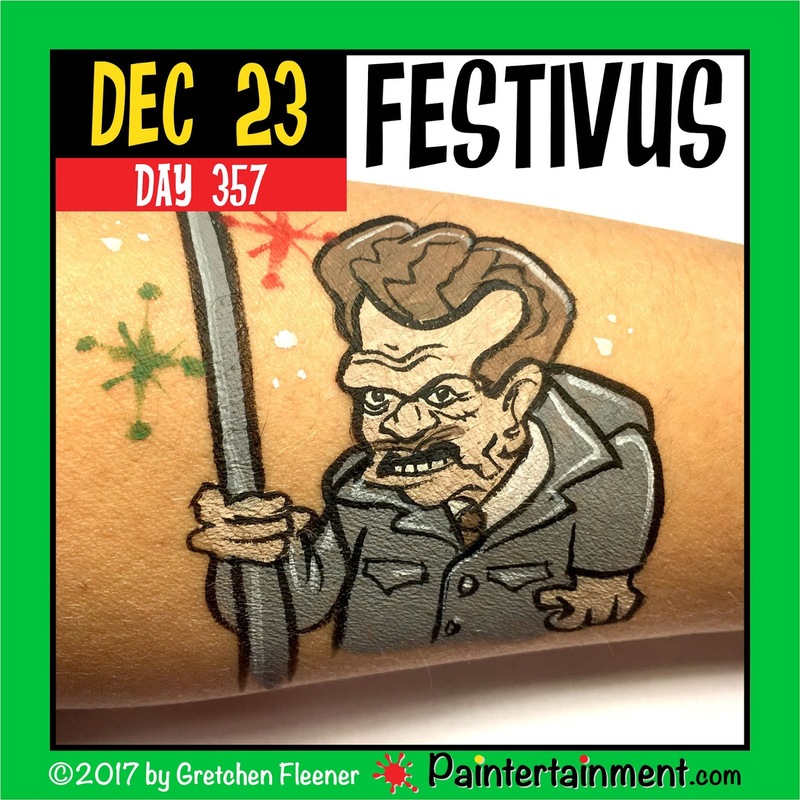 Thanks so much for following me throughout this fun year of paintings! I'm excited to see what 2018 brings, where I hope to use the time I previously used for this challenge to go back and re-paint some designs that I wanted to spend more time on, and do some more You Tube videos and blogging! Happy new year everyone!! Celebrate Day 364: "Bacon Day!" 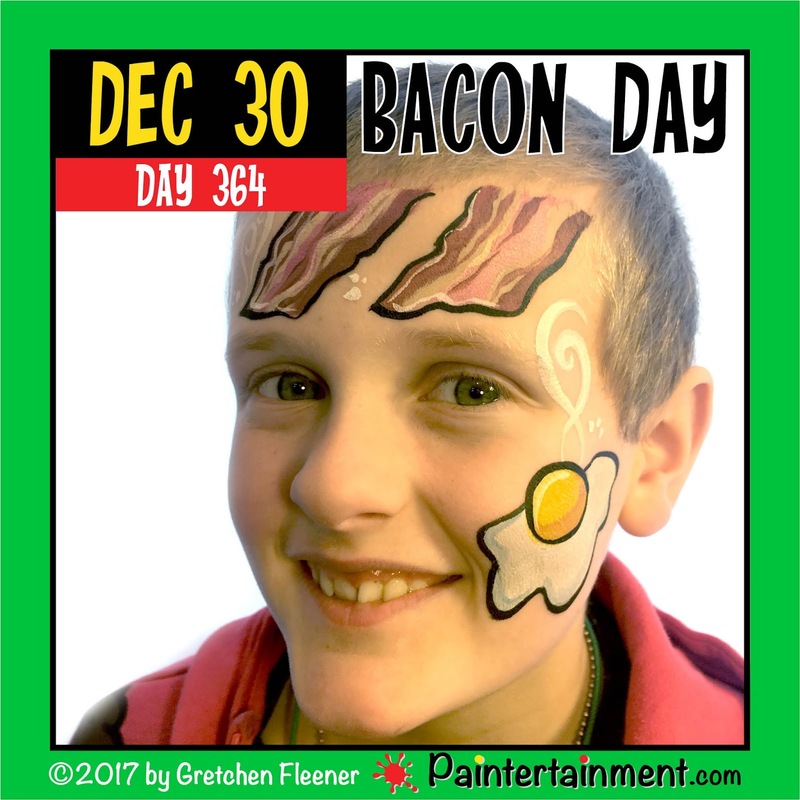 Happy bacon day!! I just couldn't leave it without an egg too! 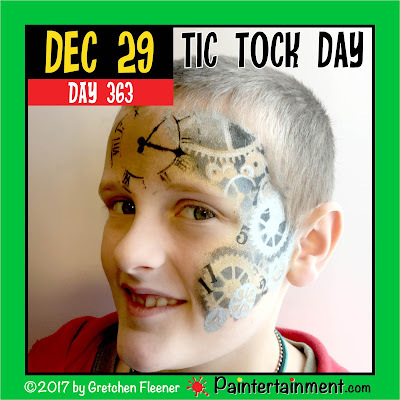 Celebrate Day 363: "Tick Tock Day!" Happy tick tock day! This design took just a couple minutes with some of my awesome stencils!! I laid down a base of metallic silver, gold and bronze with a sponge. Then layered some gear stencils with a FAB steel black shimmer and my clock face stencil in matte Paradise black on top! Celebrate Day 362: "Card Playing Day!" I've been wanting to blog about this super fun belly painting I did last month, but was waiting for the professional photos to come in first as I knew they would be so much better than my own! 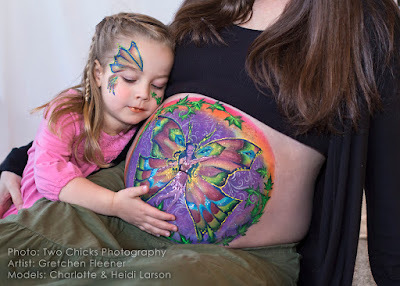 ;-) In November I had the absolute pleasure and privilege to paint not only the belly of this beautiful momma Heidi, but a corresponding face on her gorgeous little girl Charlotte as well!! 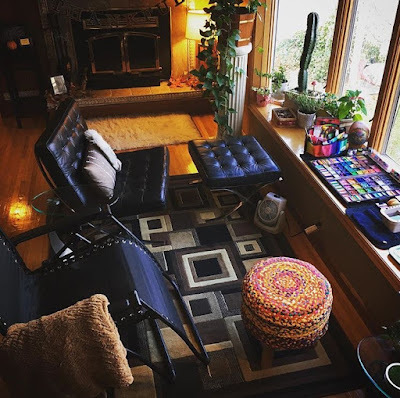 Normally I paint bellies in my living room but this time decided to try a different little area nearby, right in front of a window overlooking the lake. 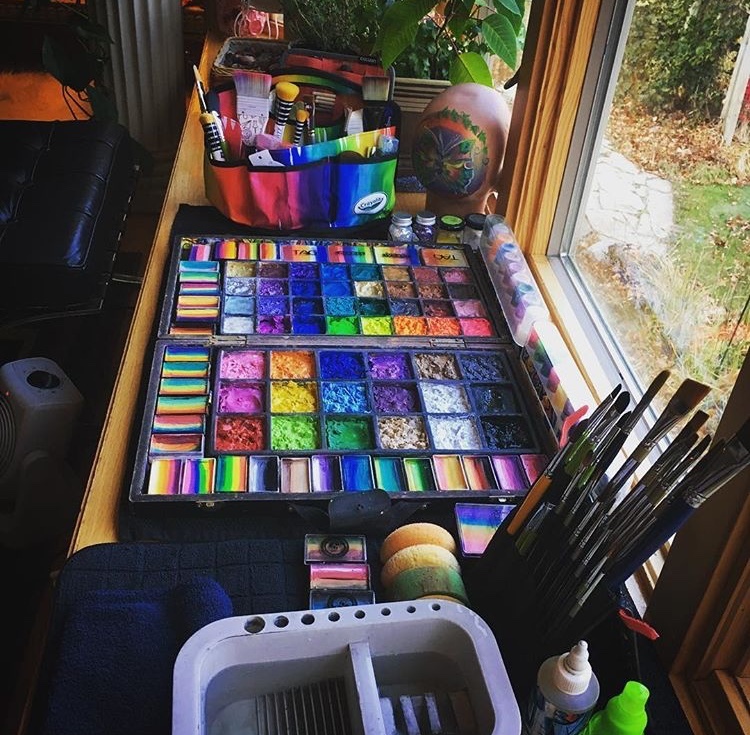 I think it worked really well and the bay window was a great spot to put all my paints! 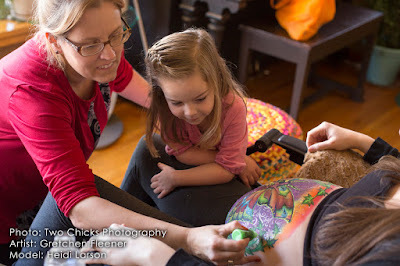 Heidi invited a professional photographer Michelle Johnson of 2 Chicks Photography to come out and capture the morning! She arrived a little ways into the painting which worked out well, as she was able to get some photos of the painting in progress. 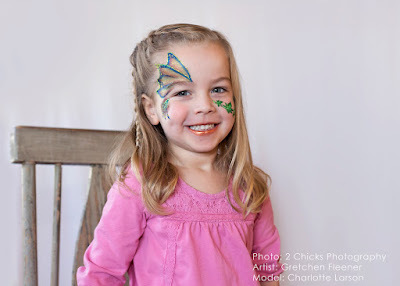 The design is a butterfly fairy, with some ivy incorporated to represent baby girl "Ivy" growing inside! Love that name!! 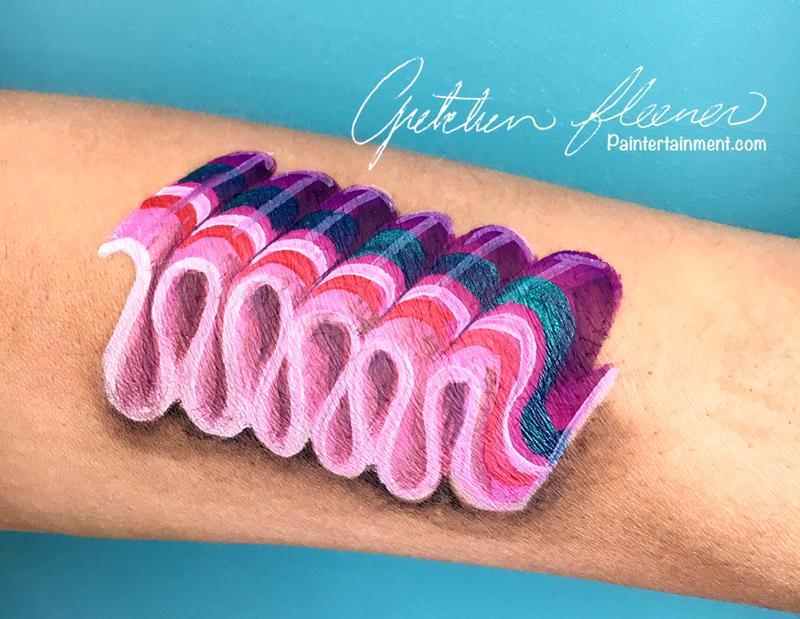 Heidi requested more earthy tones, but also rainbows, which I incorporated around the edges with my favorite FAB Glitter Rainbow cake! The silver swirls you see in the background were done with a BAM #2005 stencil. Charlotte enjoyed watching Momma's belly transform, in between playing with our extensive collection of toys, haha! ;-) Our main floor is really open, and well stocked with Legos, Playmobil and movies, so it's easy for kiddos to join in the fun and go play while still being within view of mom! 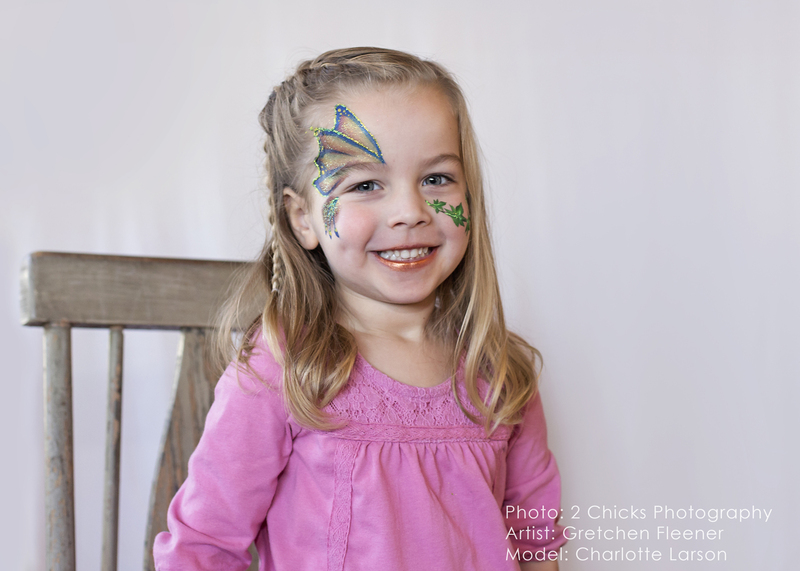 While the photographer got her area set up and started taking a few photos of just the belly painting, I did a quick little coordinating butterfly design on Charlotte, incorporating some ivy on the other cheek. I always love to capture those precious "mirror moments" whenever I can!! 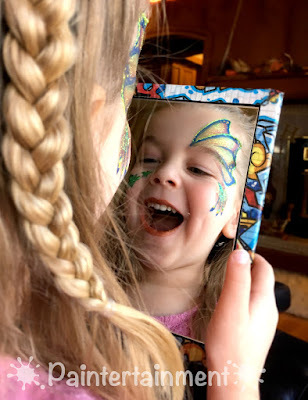 This is why we do it, folks...just look at those dimples!!! 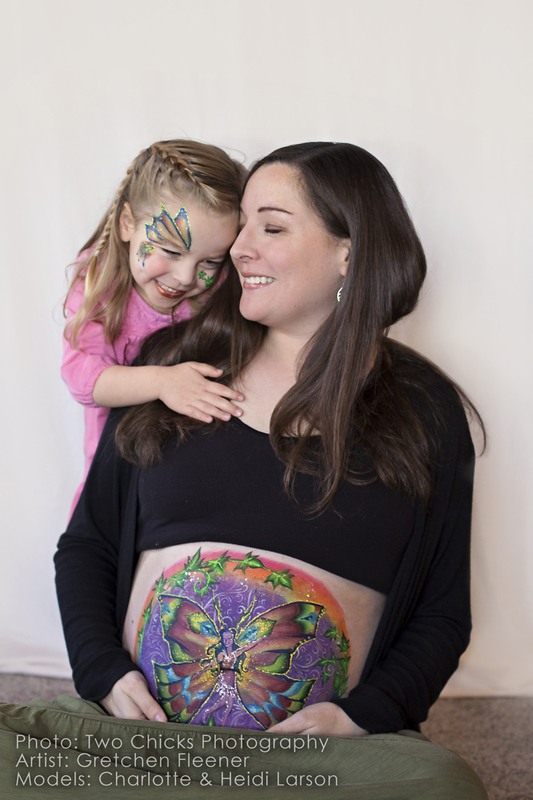 I had such a great time painting Heidi, and am so pleased to say that baby Ivy arrived happy and healthy just recently! What an honor it is to be a part of commemorating something so special. 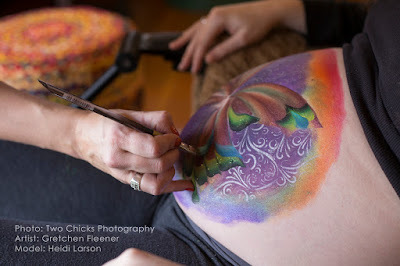 Belly painting is my all time favorite!! Thank you Heidi and Charlotte for choosing me to share in this beautiful experience with you!! 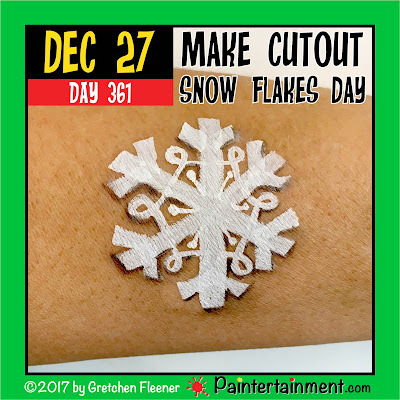 Celebrate Day 361: "Make Cutout Snowflakes Day!" 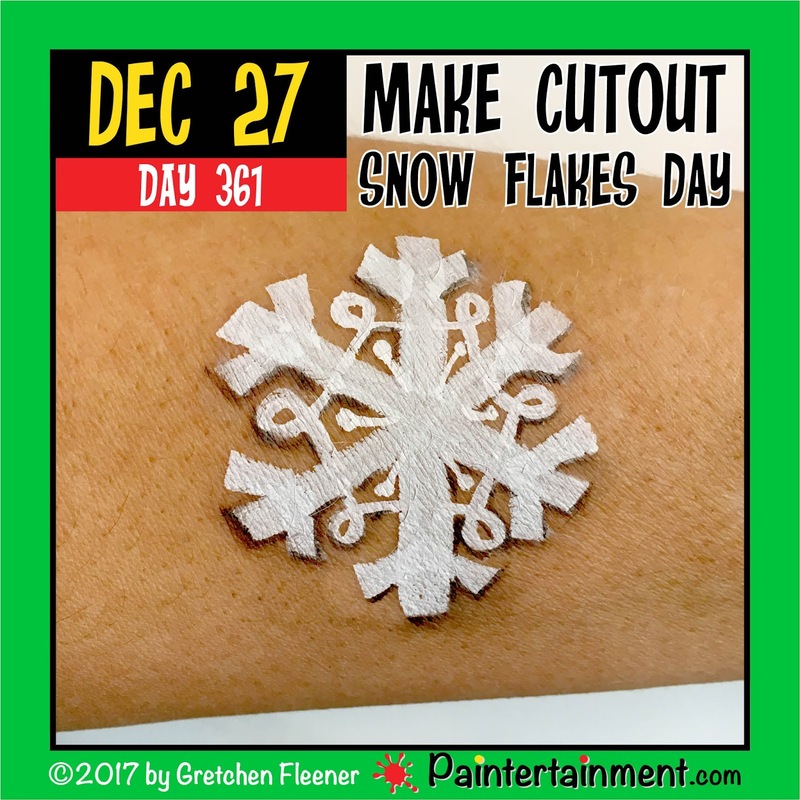 Happy "make cutout snowflakes day!" Celebrate Day 360: "Candycane Day!" Celebrate Day 359: "Pumpkin Pie Day!" Celebrate Day 358: "Egg Nog Day!" 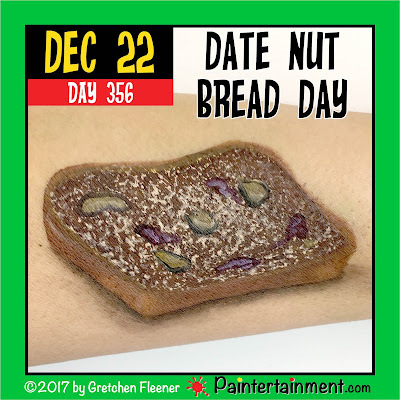 Celebrate Day 356: "Date nut Bread Day!" Happy date nut bread day! I don't like dates or nuts in my bread, but hey, today's your day if you do!! Haha! 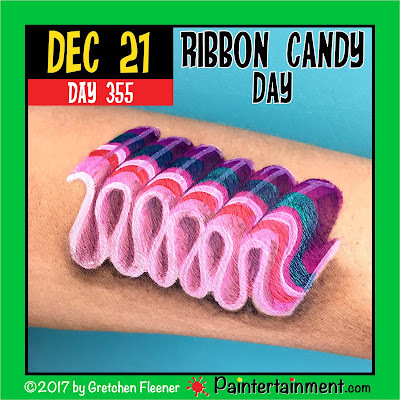 Celebrate Day 355: "Ribbon Candy Day!" 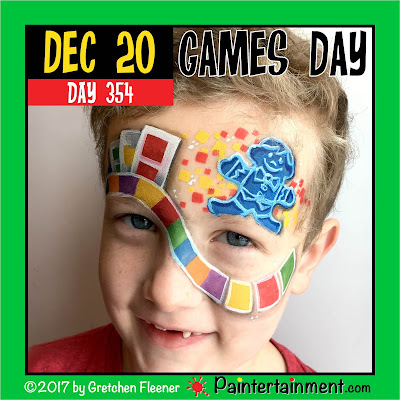 Celebrate Day 354: "Games Day!" 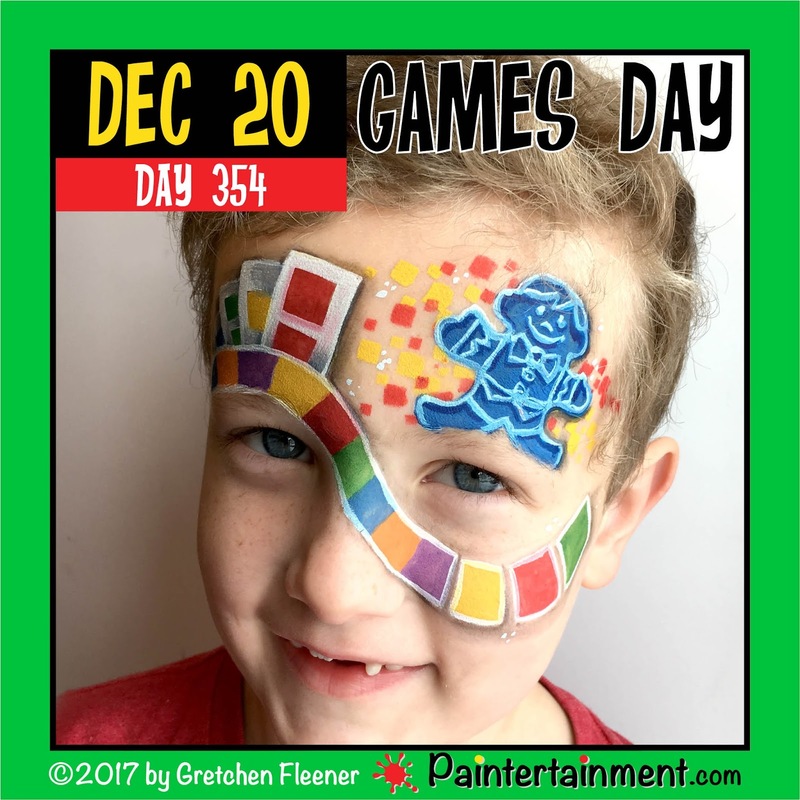 Happy games day!! 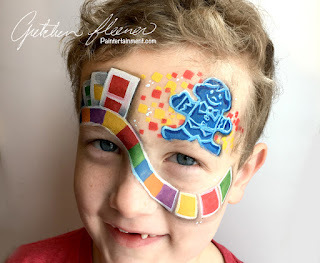 Who doesn't know and love Candyland?! 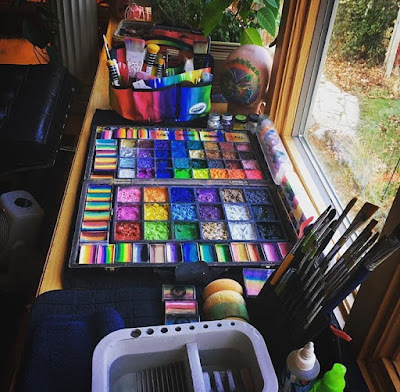 The little square pattern in the background was done with my Graffiti Eyes stencils...my most favorite and indispensable set of stencils!! 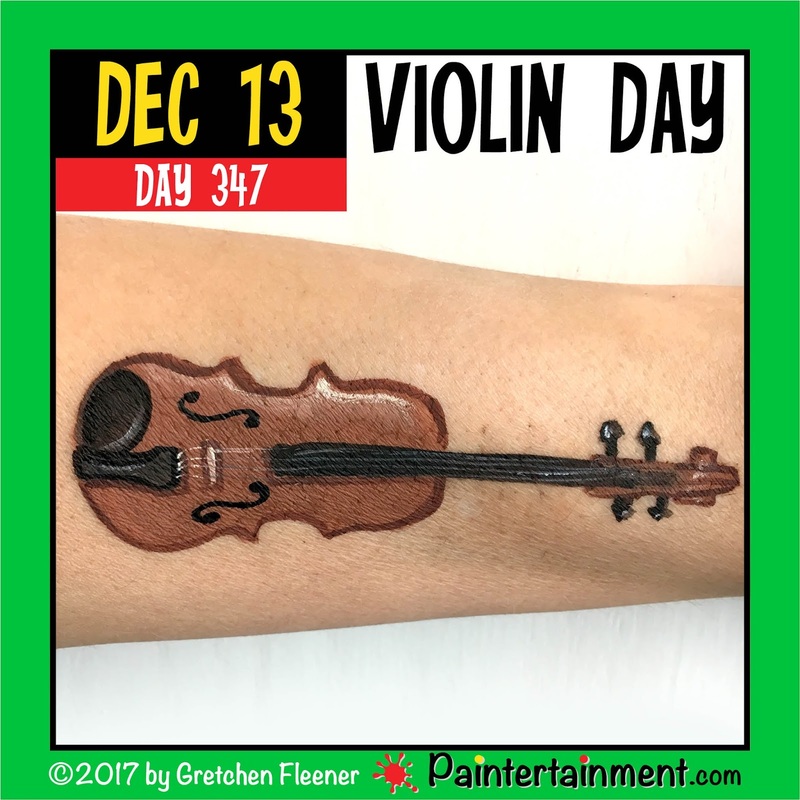 I use my little mini wood daubers to enable me to add background patterns last...since they are so small, I can work the pattern around the fine details of my design's edges! This way I'm not layering paint over paint, wasting the paint and mixing colors together. Celebrate Day 353: "Look for an Evergreen Day!" 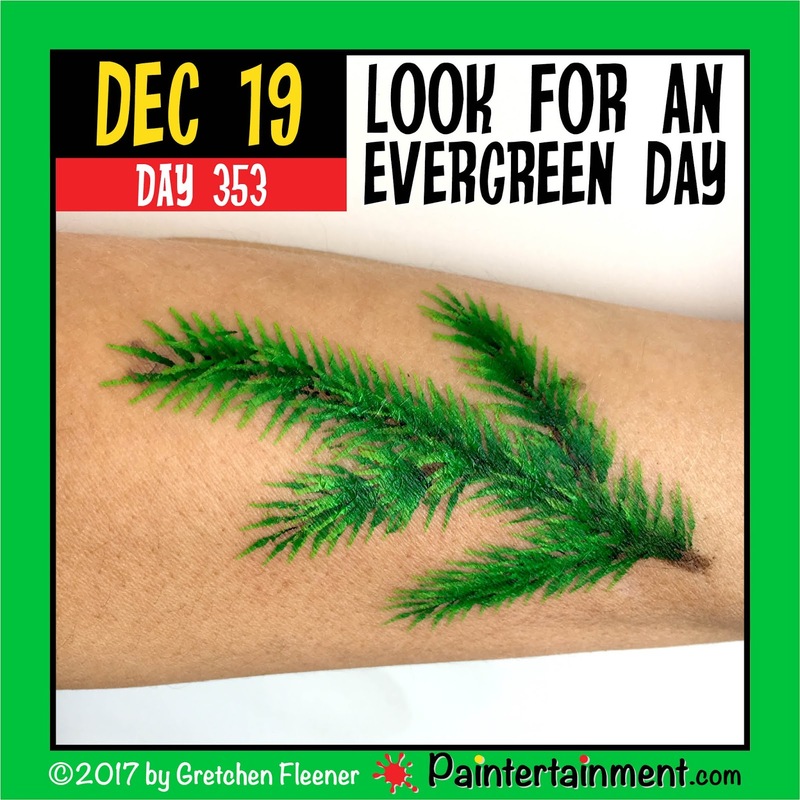 Happy look for an evergreen day! Mmmm...I love the smell of evergreens...I've only ever had a real tree! Pine needles are super quick and impressive with a split cake! Celebrate Day 352: "Bake Cookies Day!" Happy bake cookies day! Here's a Christmas classic...Spritz! Celebrate Day 351: "Maple Syrup Day!" 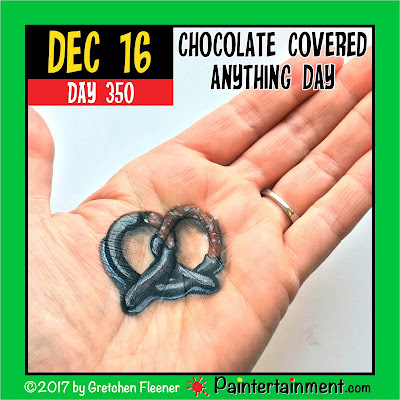 Celebrate Day 350: "Chocolate Covered Anything Day!" Happy chocolate covered anything day! My favorite thing to cover with chocolate is pretzels! 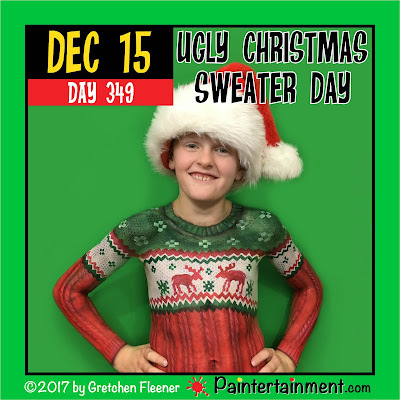 Celebrate Day 349: "Ugly Christmas Sweater Day!" Happy ugly Christmas sweater day! Sam is such a great sport...he sat for an hour while I painted this sweater! 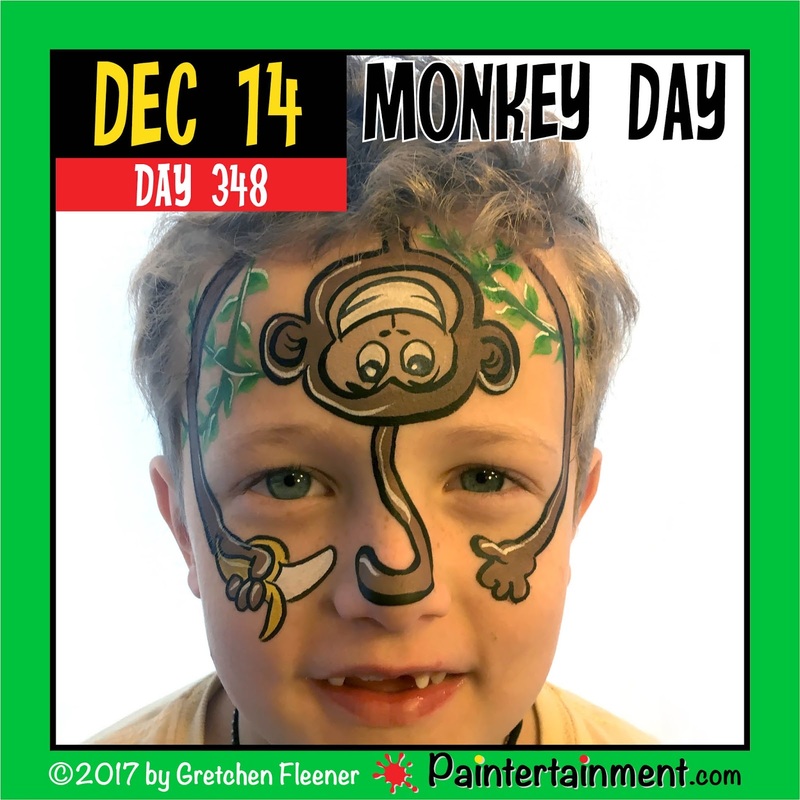 Celebrate Day 348: "Monkey Day!" 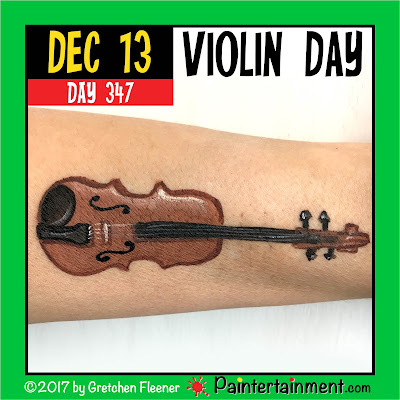 Celebrate Day 347: "Violin Day!" 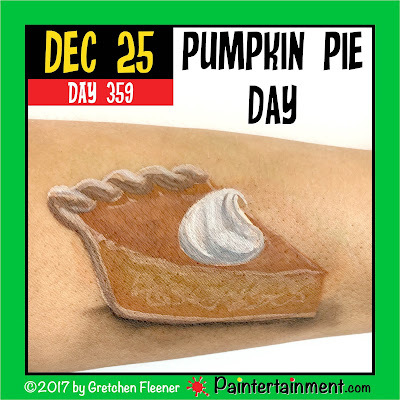 Celebrate Day 346: "Gingerbread House Day!" 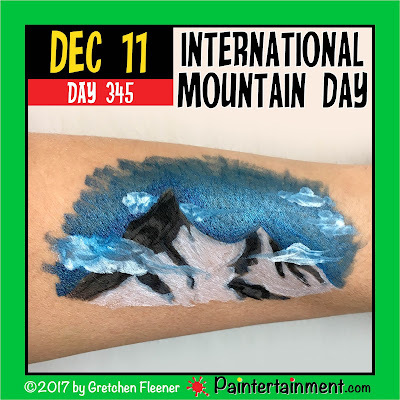 Celebrate Day 345: "International Mountain Day!" 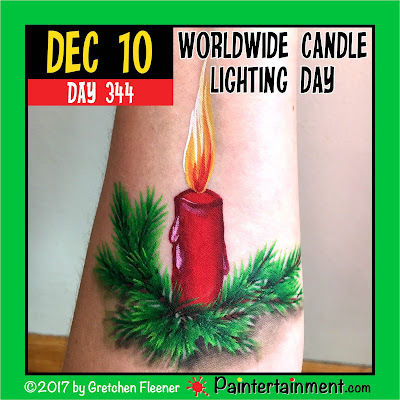 Celebrate Day 344: "Worldwide Candle Lighting Day!" Happy worldwide candle lighting day!! 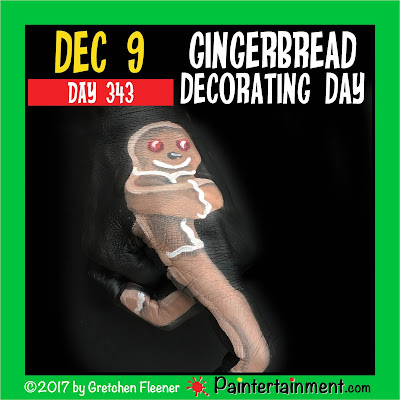 Celebrate Day 343: "Gingerbread Decorating Day!" 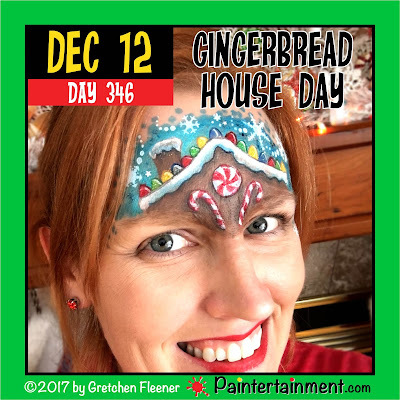 Happy gingerbread decorating day! Originally I painted a gingerbread house for this day, but then noticed gingerbread house day is coming up soon, so I saved that one, haha! 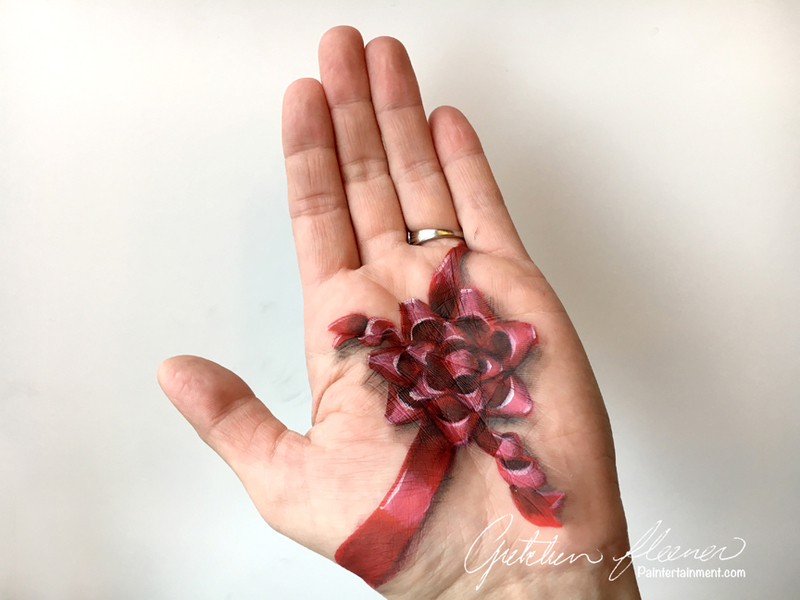 Here's a running gingerbread man on my hand! 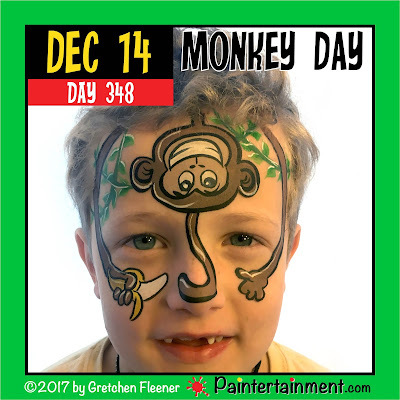 Celebrate Day 342: "Pretend to be a Time Traveler Day!" 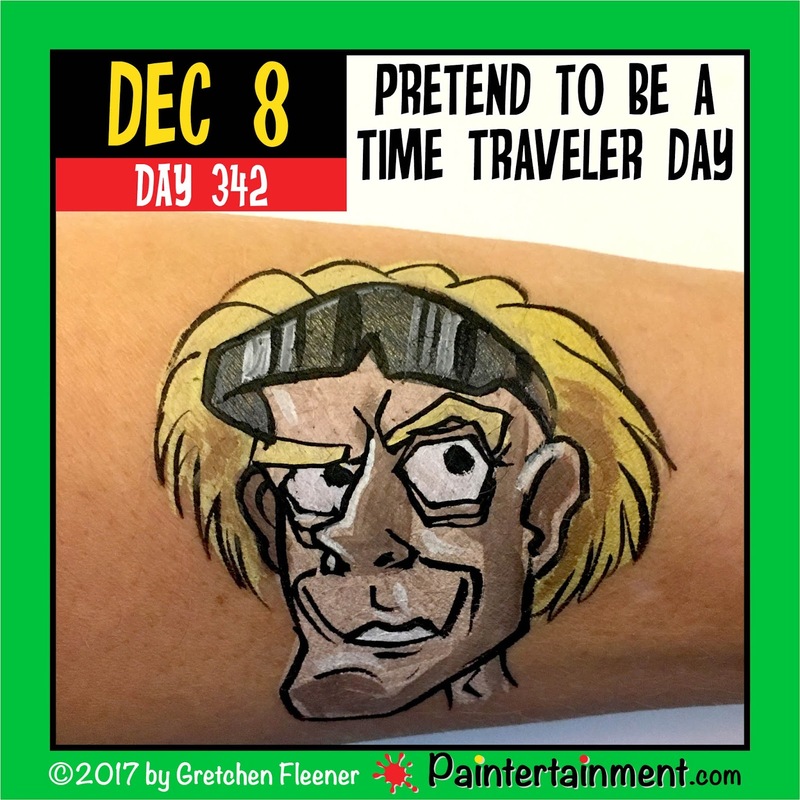 Happy "pretend to be a time traveler day!" Here's a painting of Doc Brown from Back to the Future!! 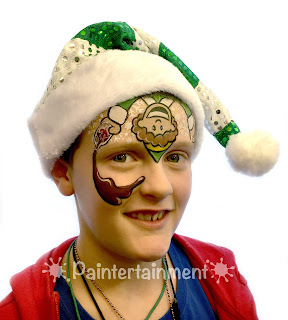 No, I'm not good at caricatures...I have Google images to thank for this inspiration!! 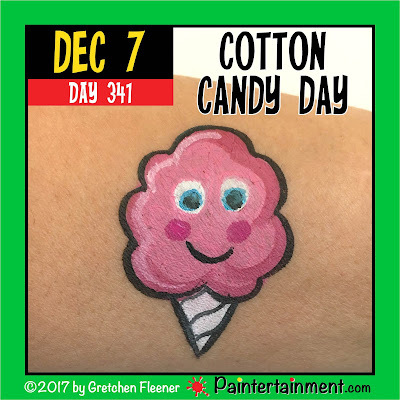 Celebrate Day 341: "Cotton Candy Day!" 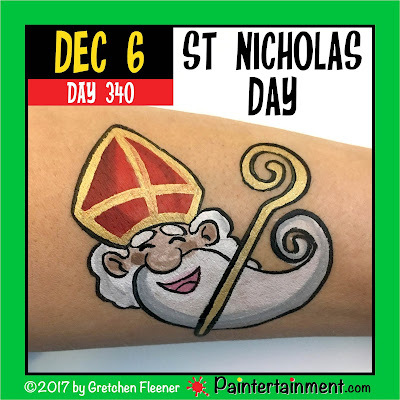 Celebrate Day 340: "St. Nicholas Day!" Happy St. Nicholas Day! 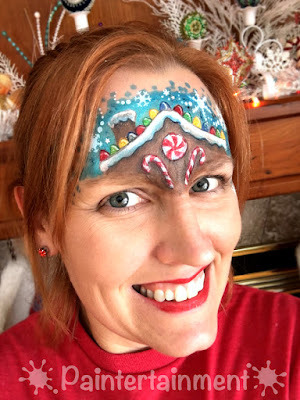 This was a cute image found via a Google image search...it would make a great forehead design!! 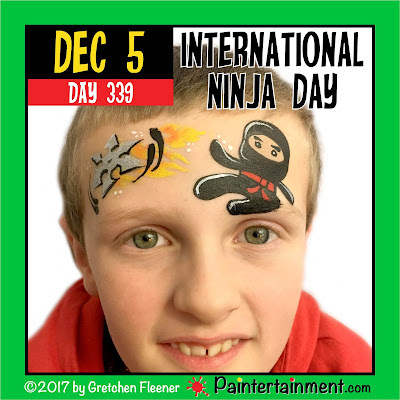 Celebrate Day 339: "International Ninja Day!" 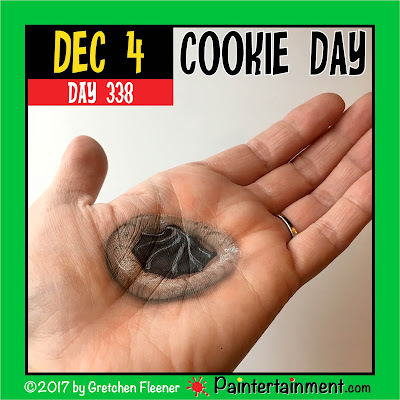 Celebrate Day 338: "Cookie Day!" Happy cookie day! 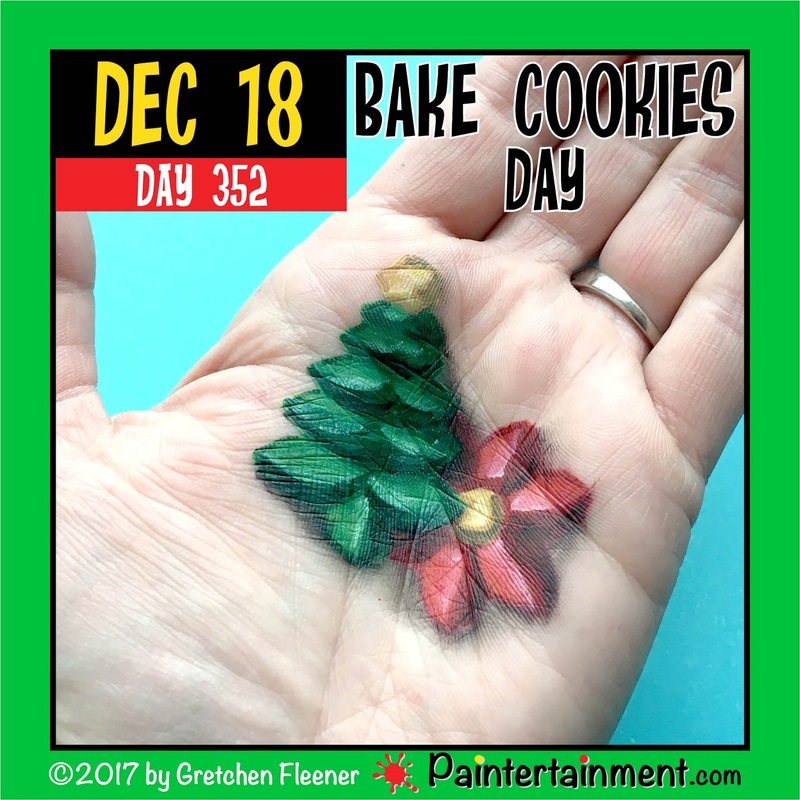 I thought it would be fitting to paint a Christmas cookie this month! Here's one of my favorites, chocolate stars! 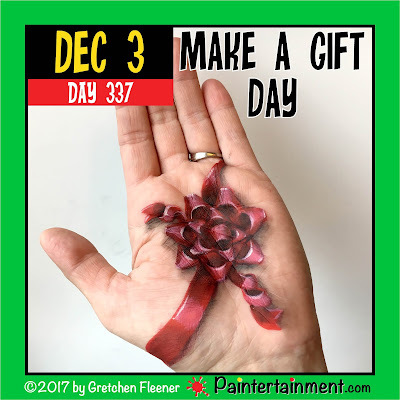 Celebrate Day 337: "Make a Gift Day!" 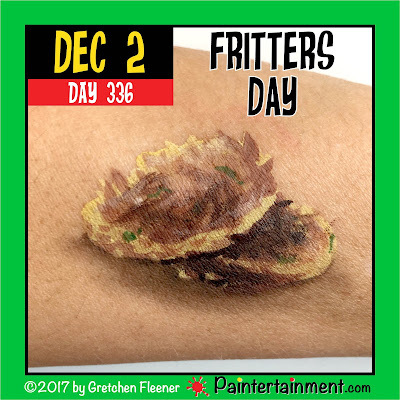 Celebrate Day 336: "Fritters Day!" Happy fritters day! Well, I'll be honest, I wasn't all that thrilled to paint fritters but it was the only option for this day, ha! So, here are a couple of fritters! 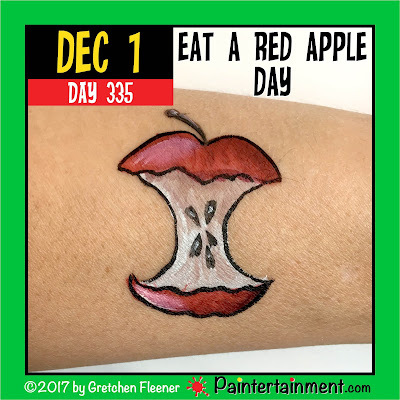 Celebrate Day 335: "Eat A Red Apple Day!" Happy eat a red apple day! !